Sunday wasn't a total loss for Belgium. David Goffin lost to Andy Murray of Great Britain in the clinching match of the Davis Cup final in Ghent, Belgium. But No. 1 seed Yanina Wickmayer defeated No. 5 Nicole Gibbs of Marina del Rey in the Los Angeles area 6-3, 7-6 (4) for the title in the $125,000 Carlsbad Classic in the San Diego region. "It's great finishing my year off with a title," Wickmayer said on wtatennis.com. "It's my second title in a very short time, so I'm very excited and very happy to be able to finish my 2015 season in his way." Wickmayer, who at 6 feet (1.82 meters) is six inches (15.2 centimeters) taller than Gibbs, raced to a 5-0 lead in the first set and trailed 4-1 in the second set before recovering. Wickmayer, a former top-15 player, did not lose a set in the tournament. She pocketed $20,000 and rose eight places in the world rankings to No. 41. Gibbs, a former Stanford star playing in the biggest final of her career, earned $11,000 and improved 13 spots to No. 109. Wickmayer will get straight into the Australian Open in January after reaching the fourth round in Melbourne this year. Gibbs likely will fall just short of the Australian Open main draw and be relegated to qualifying. She gained direct entry this year and advanced to the second round. Both Wickmayer, 26, and Gibbs, 22, have had strong falls. Wickmayer won her fourth career WTA title and first in five years in Tokyo in September, but the highest-ranked player she beat was No. 61 Ajla Tomljanovic of Croatia in the semifinals. Gibbs was playing in her third final in her past five tournaments. She was the runner-up in $50,000 Challengers in Kirkland, Wash., in October and Waco, Texas, this month. Wickmayer reached the semifinals of the 2009 U.S. Open and climbed to a career-high No. 12 the following year. She advanced to the semifinals of the Bank of the West Classic at Stanford in 2012, lost in the first round the next two years and did not return this year. Wickmayer became aware late last season that she was fighting Lyme disease, which is transmitted through tick bites and causes a fever, headaches, fatigue and a rash. Gibbs gained the third round of last year's U.S. Open. She has advanced to the second round of the Bank of the West Classic on her former home courts three times, this year as a qualifier. David Goffin played the point perfectly. Still, it wasn't good enough. After a long rally, the 5-foot-11 (1.80-meter) Belgian slugged an inside-out forehand to the corner on the indoor clay surface in Ghent, Belgium, in the Davis Cup final. Andy Murray, a 6-foot-3 (1.90-meter) Scot, replied with a cross-court backhand. Goffin then ripped a runaround forehand in the other corner for an apparent winner. But Murray hit a lunging cross-court forehand that barely went over the net. The speedy Goffin chased the ball down and hit a forehand deep to the opposite corner. But Murray, who moves exceptionally well at his size, countered with a backhand cross-court topspin lob. Goffin could only watch helplessly as the ball landed just inside the baseline. The sensational point gave Great Britain its first Davis Cup title in 79 years. Murray collapsed on the court with his head in his hands today after his 6-3, 7-5, 6-3 victory, clinching the best-of-five-match series 3-1. The last match between Kyle Edmund of Great Britain and Ruben Bemelmans was not played. "It's obviously an amazing feeling," said Murray, who won the first of his 35 tour-level titles (fourth among active players) in San Jose in 2006. "I imagine it will take a few days before it really sinks in. But I probably haven't been as emotional as that after a match that I've won. I've been pretty upset having lost matches before, but I'd say that's probably the most emotional I've been after a win. "It's incredible that we managed to win this competition. I didn't know that would ever be possible. It's great." Murray, however, was the only member of the "Big Four"-- which also includes Novak Djokovic, Roger Federer and Rafael Nadal -- to commit fully, if at all, to the Davis Cup this year. Powerful Spain did not qualify for the elite World Group because it lost at Brazil in a playoff last September without its top three singles players (Nadal, David Ferrer and Feliciano Lopez). Defending champion Switzerland, playing without Federer and two-time Grand Slam singles champion Stan Wawrinka, fell at Belgium in March in the opening round of the World Group. Serbia, playing without the top-ranked Djokovic, lost at Argentina in the World Group quarterfinals in July. Murray, on the other hand, went 11-0 in Davis Cup matches this year. His 8-0 singles record tied John McEnroe and Mats Wilander for the best in a calendar year. James Ward was the only other Brit to win a singles match this year. Murray became the first player since Pete Sampras of the United States 20 years ago to win three live matches in a Davis Cup final. He defeated Bemelmans in straight sets on friend and teamed with his older brother, Jamie, to beat Steve Darcis and Goffin in four sets in Saturday's doubles match. Great Britain moved ahead of France for sole possession of third place with 10 Davis Cup titles. The United States has 32 and Australia 28. Murray won three titles early in his career in Northern California. He captured the Aptos Challenger 10 years ago at 18 and the now-defunct SAP Open in San Jose on the ATP World Tour in 2006 and 2007. In 2013, Murray became the first British man to win Wimbledon in 77 years. Fred Perry had been the last to accomplish the feat, earning the crown in 1936. That also was the last year Great Britain had captured the Davis Cup until today. Belgium has never won the prestigious team competition. Great Britain its first Davis Cup title in 79 years today. Two years ago, Andy Murray ended one British drought. Today, he can stop another. Murray and his older brother, Jamie, outclassed David Goffin and Steve Darcis of Belgium 6-4, 4-6, 6-3, 6-2 on Saturday to give Great Britain a 2-1 lead in the best-of-five-match Davis Cup final on indoor clay in Ghent, Belgium. Murray, ranked second, can give his country its first Davis Cup title in 79 years with a victory over Goffin, ranked 16th, in today's first singles match (4 a.m. California time, Tennis Channel). Kyle Edmund, who made his Davis Cup debut at 20 in a five-set loss to Goffin on Friday, is scheduled to play left-handed veteran Ruben Bemelmans in the last match. Andy Murray in 2013 became the first British man to win Wimbledon in 77 years. Fred Perry had been the last one, in 1936. That also was the last year Great Britain has captured the Davis Cup. Belgium has never won the prestigious team competition. The 5-foot-11 (1.80-meter) Goffin has not won a set in two matches against the 6-foot-3 (1.90-meter) Murray, who crushed the Belgian 6-1, 6-0 three weeks ago in the third round in Paris. This will be their first match on clay, but that's little consolation for Goffin. Murray is 28-8 in the French Open on clay, and Goffin is 5-4. Wickmayer in the final of the $125,000 Carlsbad Classic. No. 5 seed Nicole Gibbs of Marina del Rey in the Los Angeles area beat unseeded Jennifer Brady of Boca Raton, Fla., 6-0, 6-4 on Saturday to reach the final of the $125,000 Carlsbad Classic in the San Diego region. Brady was broken six times and Gibbs twice in the 68-minute match. Brady, a 20-year-old ex-UCLA star, won only 43 percent of the points on her first serve (17 of 40). Neither player had an ace. The 22-year-old Gibbs, who won two NCAA singles titles at Stanford, will face No. 1 seed Yanina Wickmayer of Belgium for the first time in today's 1 p.m. (PST) final. Wickmayer, 26, downed unseeded Maria Sakkari of Greece 6-4, 6-2. The 6-foot (1.82-meter) Wickmayer is six inches (15.2 centimeters) taller than Gibbs. Wickmayer is ranked 49th and Gibbs 122nd. Wickmayer reached the semifinals of the 2009 U.S. Open and a career-high No. 12 the following year. She advanced to the semifinals of the Bank of the West Classic at Stanford in 2012, lost in the first round the next two years and did not return this year. Gibbs, who gained the third round of last year's U.S. Open, will be playing in her third final in her past five tournaments. She was the runner-up in $50,000 Challengers in Kirkland, Wash., in October and Waco, Texas, in November. David Goffin avoided a stunning upset on Friday to give host Belgium a 1-0 lead over Great Britain in the Davis Cup final. Andy Murray then won in straight sets to tie the best-of-five-match series on indoor clay in Ghent, Belgium, 1-1 entering today's doubles encounter. Great Britain seeks its first Davis Cup title in 79 years. Belgium has never won the prestigious team competition. Goffin defeated 20-year-old Kyle Edmund, making his Davis Cup debut, 3-6, 1-6, 6-2, 6-1, 6-0 in a virtual must-win match for Belgium. The diminutive but supremely talented Goffin, 24, overcame a two-sets-to-none deficit for the first time in his career. "I was a little bit worried because Kyle was playing unbelievable," Goffin, ranked No. 16 to Edmund's No. 100, told reporters. "He just had nothing to lose. He played a wonderful match. But I knew I had a chance. "I knew it's always tough when you are young, when you're playing your first match in Davis Cup, to play three sets like this. That's why I tried to stay calm and wait for a chance." Murray, ranked No. 2, defeated Ruben Bemelmans, a veteran left-hander ranked No. 108, 6-3, 6-2, 7-5. Bemelmans committed 33 unforced errors, more than twice as many as Murray. All of the singles players except Goffin have played, and excelled, in Northern California. Murray won the Aptos Challenger 10 years ago at 18 and the now-defunct SAP Open in San Jose on the ATP World Tour in 2006 and 2007. Edmund reached the semifinals of this year's Aptos Challenger, and Bemelmans won the doubles title there last year with Laurynas Grigelis of Lithuania. In today's doubles match, Murray and his older brother, Jamie, will play Kimmer Coppejans and Steve Darcis. Jamie Murray is ranked seventh in doubles. Coppejans won the 2012 French Open boys singles title. No. 5 seed Nicole Gibbs of Marina del Rey in the Los Angeles area wore down No. 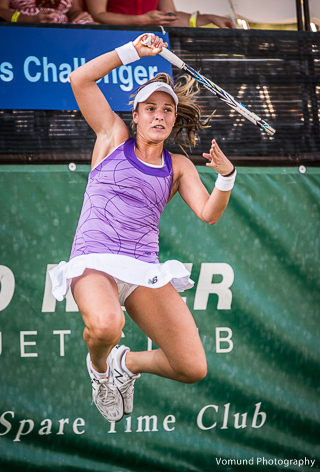 2 Tatjana Maria of Germany 6-4, 2-6, 6-1 today in the quarterfinals of the $125,000 Carlsbad Classic in the San Diego region. Maria, ranked 71st, won only 32 percent of the points on her second serve (11 of 34). In the following match, No. 1 seed Yanina Wickmayer of Belgium beat CiCi Bellis of Atherton in the San Francisco Bay Area 6-4, 6-3. Wickmayer, at 26 years old and 6 feet (1.82 meters), is 10 years older and six inches taller than Bellis, who was playing in her first tournament in almost three months after a bout with shoulder bursitis. Gibbs, a 22-year-old former two-time NCAA singles champion from Stanford, will meet unseeded Jennifer Brady of Boca Raton, Fla., in the semifinals. Brady, who turned pro in June after two years at UCLA, defeated Marina Melnikova of Russia 6-2, 7-5. This will be the second meeting between Gibbs, ranked No. 122, and Brady, who's No. 232. Gibbs triumphed 3-6, 7-6 (7), 6-2 in the second round of last year's Lexington (Ky.) Challenger. In the other semifinal, the 49th-ranked Wickmayer will face unseeded Maria Sakkari of Greece. The 20-year-old Sakkari, ranked 182nd, eliminated Samantha Crawford of Tamarac, Fla., 6-1, 6-7 (3), 6-2. Crawford, 6-foot-2 (1.88 meters), won the 2012 U.S. Open girls singles title and reached the semifinals of the inaugural Sacramento Challenger that year. Kristie Ahn couldn't beat top-seeded Yanina Wickmayer. Now CiCi Bellis will try. Wickmayer, a 6-foot (1.82-meter) Belgian, defeated Ahn, a 5-foot-5 (1.65-meter) former Stanford All-American, 7-5, 6-3 on Thursday to reach the quarterfinals of the $125,000 Carlsbad Classic in the San Diego area. Bellis, 16, of Atherton outlasted Katerina Stewart, 18, of Miami 6-2, 5-7, 6-4 in 2 hours, 22 minutes. Bellis, who lives minutes from Stanford, is playing in her first tournament in almost three months after a bout with shoulder bursitis. Ahn's former teammate Nicole Gibbs, a resident of Marina del Rey in the Los Angeles area, will face second-seeded Tatjana Maria of Germany. Gibbs and Maria advanced on Wednesday. Wickmayer is 10 years older than the 5-foot-6 (1.68-meter) Bellis. Both have had success in the U.S. Open. Wickmayer reached the semifinals in Flushing Meadows in 2009. Bellis stunned 12th-seeded Dominika Cibulkova of Slovenia in the first round there last year before losing to Kazakhstan's Zarina Diyas, then ranked 48th, in three sets in the second round. 6-3, 6-2 in the Carlsbad Classic. No. 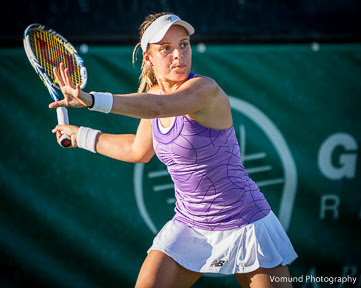 5 seed Nicole Gibbs of Marina del Rey in the Los Angeles area defeated Veronica Cepede Royg of Paraguay 6-3, 6-2 today to reach the quarterfinals of the $125,000 Carlsbad Classic in the San Diego region. Gibbs, a former two-time NCAA singles champion from Stanford, converted eight of 10 break points. She will play second-seeded Tatjana Maria of Germany on Friday. Maria beat Francoise Abanda, an 18-year-old qualifier from Canada, 6-4, 6-3. Gibbs' former Stanford teammate Kristie Ahn and 16-year-old CiCi Bellis of Atherton, located minutes from Stanford, are scheduled play their second-round matches on Thursday. Ahn will take on No. 1 seed Yanina Wickmayer, a Belgian who reached the 2009 U.S. Open semifinals. Bellis, playing in her first tournament in almost three months after recovering from shoulder bursitis, will meet Katerina Stewart, 18, of Miami. Gibbs is ranked No. 122 after climbing to a career-high No. 84 in March. She reached the third round of last year's U.S. Open as a wild card before losing to 11th-seeded Flavia Pennetta of Italy. Pennetta won her first Grand Slam title at Flushing Meadows in September and retired after the WTA Finals in late October at 33. Bob Bryan and Mike Bryan tumbled to their lowest doubles rankings in more than 10 years at No. 4 and 5, respectively, this week. The 37-year-old twins and former Stanford All-Americans lost in the semifinals of last week's ATP World Tour Finals in London after winning their fourth title in the tournament last year. Consequently, they fell to their lowest ranking since both were No. 5 on June 20, 2005. It's just the latest in a series of disappointments for the Bryans this year. Marcelo Melo, a 32-year-old Brazilian who stands 6-foot-8 (2.03 meters), supplanted the Bryans at No. 1 on Nov. 2. The Bryans had been No. 1 since Feb. 25, 2013, a reign of 143 weeks. The Bryans, who have amassed a record 16 Grand Slam men's doubles titles, failed to win one this year for the first time since 2004. Also, their streak of No. 1 year-end rankings ended at six. Collin Altamirano, 19-year-old Sacramento resident -- No. 815 in singles (-2), 954 in doubles (+3). Bob Bryan, 36-year-old former Stanford star, part-time member of Sacramento-based California Dream in World TeamTennis in 2015 -- No. 4 in doubles (-2), unranked in singles. Mike Bryan, 37-year-old former Stanford star, part-time member of Dream in 2015 -- No. 5 in doubles (-2), unranked in singles. Bradley Klahn, 25-year-old former Stanford star -- No. 512 in singles (+4), No. 747 in doubles (+3). Scott Lipsky, 34-year-old former Stanford star -- No. 40 in doubles (no change). Mackenzie McDonald, 20-year-old resident of Piedmont in San Francisco Bay Area -- Career-high No. 379 in singles (+82), No. 541 in doubles (+4). Dennis Novikov, 22-year-old resident of Milpitas in San Francisco Bay Area -- Career-high No. 133 in singles (no change), No. 174 in doubles (+5). Sam Querrey, 28-year-old San Francisco native -- No. 59 in singles (no change), No. 38 in doubles (no change). Tennys Sandgren, 24-year-old member of California Dream -- No. 257 in singles (no change), No. 193 in doubles (+4). Matt Seeberger, 31-year-old San Francisco native and former UC Santa Cruz star -- No. 162 in doubles (+4). Neal Skupski, 25-year-old member of California Dream -- No. 103 in doubles (-1). Dmitry Tursunov, 32-year-old resident of Folsom in Sacramento area -- No. 262 in doubles (+1). Kristie Ahn, 23-year-old former Stanford star -- No. 211 in singles (+1), No. 409 in doubles (+1). CiCi Bellis, 16-year-old resident of Atherton in San Francisco Bay Area -- No. 242 in singles (+8). Alexandra Facey, 22-year-old product of Cameron Park in Sacramento area -- No. 623 in doubles (-4). Kat Facey, 22-year-old product of Cameron Park in Sacramento area -- No. 623 in doubles (-4). Jarmila Gajdosova, 28-year-old member of California Dream (2015) -- No. 106 in singles (no change), No. 141 in doubles (-2). Anabel Medina Garrigues, 33-year-old member of California Dream (2015) -- No. 32 in doubles (no change). Nicole Gibbs, 22-year-old former Stanford star -- No. 122 in singles (-1), No. 196 in doubles (-2). Michaela Gordon, 16-year-old resident of Saratoga in San Francisco Bay Area -- No. 658 in singles (+2), No. 856 in doubles (-3). Raquel Kops-Jones, 32-year-old San Jose resident and former Cal star -- No. 18 in doubles (no change). Maegan Manasse, 20-year-old Cal junior -- No. 528 in doubles (-10), No. 754 in singles (-1). Maria Sanchez, 25-year-old Modesto product -- No. 86 in doubles (+1), No. 194 in singles(-1). Carol Zhao, 20-year-old Stanford junior -- No. 192 in doubles (-2), No. 343 in singles (+4). Two singles matches, 4:30-10:30 a.m. (live). Doubles match, 6-9 a.m. (live). Two singles matches, 4-10 a.m. (live). Friday-Sunday -- Davis Cup final, Great Britain at Belgium. Today-Dec. 6 -- Eddie Herr International Championships, Bradenton, Fla.
Monday-Dec. 6 -- USTA National Men's and Women's 50 Hard Court Championships, La Jolla, Calif.
Dec. 7-13 -- Orange Bowl, boys and girls 18 and 16 singles and doubles, Plantation, Fla.
Dec. 13-22 -- Junior Orange Bowl, boys and girls 14 and 12 singles, Coral Gables, Fla.
Dec. 27-Jan. 2, 2016 -- USTA National Winter Championships, boys and girls 18 and 16 singles and doubles, Scottsdale, Ariz.
Dec. 27-Jan. 2, 2016 -- USTA National Winter Championships, boys and girls 14 and 12 singles and doubles, Tucson, Ariz.
Jan. 18 (Jan. 17 in United States)-Jan. 31, 2016 -- AUSTRALIAN OPEN. 2015 champions: Novak Djokovic, Serena Williams, Simone Bolelli/Fabio Fognini, Bethanie Mattek-Sands/Lucie Safarova, Martina Hingis/Leander Paes. Jan. 22-24 -- Intercollegiate Tennis Association Kick-Off Weekend, 30 campus sites. Feb. 6-7, 2016 -- Fed Cup, first round, United States vs. Poland in World Group II, Kailua Kona, Hawaii. Feb. 5-8, 2016 -- Intercollegiate Tennis Association National Women's Team Indoor Championships, Madison, Wis.
Feb. 12-15, 2016 -- Intercollegiate Tennis Association National Men's Team Indoor Championships, Charlottesville, Va.
March 4-6, 2016 -- Davis Cup, first round, United States at Australia. March 7-20, 2016 -- BNP Paribas Open, Indian Wells, Calif. 2015 champions: Novak Djokovic, Simona Halep, Vasek Pospisil/Jack Sock, Martina Hingis/Sania Mirza. It didn't take long for CiCi Bellis to get back in the swing of things. Playing her first match in almost three months, the 16-year-old resident of Atherton in the San Francisco Bay Area upset sixth-seeded Julia Glushko of Israel 6-3, 6-4 today in the first round of the $125,000 Carlsbad Classic in the San Diego region. Bellis, who had been out with shoulder bursitis, converted seven of 17 break points. Oddly, the 126th-ranked Glushko won a higher percentage of points on her second serve (54) than on her first (42). Bellis, ranked No. 242 after reaching a career-high No. 152 in July, will face 18-year-old Katerina Stewart of Miami on Thanksgiving. Stewart, ranked No. 170, defeated Paula Cristina Goncalves of Brazil 7-5, 6-3 on Monday. Bellis, an amateur, is 3-0 against Stewart in pro tournaments and 1-0 against her in the juniors. The winner of the Bellis-Stewart match will play either top-seeded Yanina Wickmayer, a 2009 U.S. Open semifinalist from Belgium, or former Stanford All-American Kristie Ahn of the United States. Ahn outlasted Dalila Jakupovic of Slovenia 6-4, 4-6, 6-4 today. Nicole Gibbs, Ahn's former Stanford teammate, also advanced to the second round. Gibbs, seeded fifth, led Alla Kudryavtseva of Russia 6-3, 3-2 on Monday when Kudryavtseva was defaulted. One spectator said Kudryavtseva threw her racket on the court so hard that it bounced up and nearly hit a man in the crowd. Kudryavtseva then stormed off the court, according to the spectator, and later was crying near the parking lot. Gibbs and Kudryavtseva helped the Austin Aces reach the World TeamTennis final in July. Gibbs will meet Paraguay's Veronica Cepede Royg, a 6-0, 6-3 winner over Gabriela Ce of Brazil, in the second round. So much for Roger Federer's straight-set victory over Novak Djokovic on Tuesday. Djokovic, seeded No. 1, capped one of the greatest years in history with a 6-3, 6-4 triumph over No. 3 Federer today in London for the title in the ATP World Tour Finals. Federer double-faulted on match point. Federer ended Djokovic's winning streak at 23 matches with a 7-5, 6-2 victory on Tuesday in the round-robin portion of the ATP Finals, which consisted of the top eight singles players and top eight doubles teams of the year. Djokovic earned a record fourth straight title in the ATP Finals, surpassing Ilie Nastase (1971-73) and Ivan Lendl (1985-87). The tournament began in 1970. Djokovic tied Lendl and Pete Sampras with five ATP Finals titles, second behind Federer's six. Djokovic came within one match of earning the first calendar-year Grand Slam since Rod Laver in 1969, losing in four sets to Stan Wawrinka in the French Open. It's the only major title Djokovic hasn't won. "I'm obviously very proud to have these achievements with my team," the 28-year-old Djokovic, who went 82-6 this year, said during the awards ceremony. "It's been a long season, but the best of my life. Without their support and my family, I wouldn't be where I am. "I'm just trying to cherish every moment at this level, As a kid growing up, you dream to be at tournaments like this and fighting for the biggest trophies in sport." Djokovic evened his career record against the 34-year-old Federer at 22-22, including 5-3 this year. Djokovic finished at No. 1 in the rankings for the fourth time in five years. Andy Murray was a career-best second and Federer third. No. 2 seeds Jean-Julien Rojer of the Netherlands and Horia Tecau of Romania won the doubles title for the first time, beating No. 8 Rohan Bopanna of India and Florin Mergea 6-4, 6-3. Rojer and Tecau, who won their maiden Grand Slam title at Wimbledon this year, became the first doubles team to win the season finale without losing a set since round-robin play began in 1986. Top-seeded Bob and Mike Bryan's streak of year-end No. 1 doubles rankings ended at six with a 6-4, 6-4 loss to second-seeded Jean-Julien Rojer of the Netherlands and Horia Tecau of Romania today in the semifinals of the ATP World Tour Finals in London. Rojer and Tecau clinched the top spot after defeating the 37-year-old Bryan twins, the defending and four-time champions, for the first time in six matches. Rojer and Tecau will meet eighth-seeded Rohan Bopanna of India and Florin Mergea of Romania in Sunday's final (7:30 a.m. PST, Tennis Channel), guaranteeing that a Romanian will win the doubles title for the first time. Bopanna and Mergea beat third-seeded Ivan Dodig of Croatia and Marcelo Melo of Brazil 6-4, 6-2. The Bryans failed to win a Grand Slam men's doubles title this year for the first time since 2004. The former Stanford stars have won a record 16 Slams in men's doubles. In addition, Melo replaced the Bryans at No. 1 on Nov. 2. It was the first time since Sept. 9, 2012, that neither Bryan was ranked No. 1. In singles, No. 1 seed Novak Djokovic and No. 3 Roger Federer also advanced to Sunday's final (10 a.m., ESPN2) with straight-set victories. Djokovic, trying to become the first player to win four straight ATP Finals crowns, dismissed No. 5 Rafael Nadal 6-3, 6-3. Federer, seeking his seventh ATP Finals title, topped Swiss countryman Stan Wawrinka 7-5, 6-3. Federer, 34, leads the 28-year-old Djokovic 22-21 in their head-to-head series. Federer ended Djokovic's winning streak at 23 matches on Tuesday with a 7-5, 6-2 victory in the round-robin phase of the ATP Finals. No. 4 seed Stan Wawrinka of Switzerland defeated No. 2 Andy Murray of Great Britain 7-6 (4), 6-4 today to earn the last semifinal berth in the ATP World Tour Finals in London. Wawrinka will meet countryman Roger Federer, seeded third, in the semis for the second straight year on Saturday at noon (California time, Tennis Channel). Federer prevailed 4-6, 7-5, 7-6 (6) last year. Federer, a six-time ATP Finals champion, has won 17 of 20 career matches against Wawrinka. In the first semifinal, three-time defending champion Novak Djokovic, seeded No. 1, will face No. 5 Rafael Nadal at 6 a.m. (Tennis Channel). Nadal, who seeks his first ATP Finals title, leads the head-to-head series 23-22. No. 1 seeds Bob and Mike Bryan will play No. 2 Jean-Julien Rojer and Horia Tecau in the second doubles semifinal at 10 a.m. (Tennis Channel). Rafael Nadal (5), Spain, def. David Ferrer (7), Spain, 6-7 (2), 6-3, 6-4. Stan Wawrinka (4), Switzerland, def. Andy Murray (2), Great Britain, 7-6 (4), 6-4. Stan Smith group -- 1. Roger Federer 3-0 (6-1), 2. Novak Djokovic 2-1 (4-2), 3. Kei Nishikori 1-2 (3-5), 4. Tomas Berdych 0-3 (1-6). Ilie Nastase group -- 1. Rafael Nadal 3-0 (6-1), 2. Stan Wawrinka 2-1 (3-2), 3. Andy Murray 1-2 (2-4), 4. David Ferrer 0-3 (1-6). Top two players in each group advance to Saturday's semifinals. Ivan Dodig, Croatia, and Marcelo Melo (3), Brazil, def. Marcin Matkowski, Poland, and Nenad Zimonjic (7), Serbia, 3-6, 7-5 [10-6]. Jean-Julien Rojer, Netherlands, and Horia Tecau (2), Romania, def. Pierre-Hugues Herbert and Nicolas Mahut (6), France, 6-4, 7-5. Ashe/Smith group -- 1. Rohan Bopanna and Florin Mergea 2-1 (5-2), 2. Bob Bryan and Mike Bryan 2-1 (4-3). 3. Jamie Murray and John Peers 1-2 (3-5), 4. Simone Bolelli and Fabio Fognini 1-2 (3-5). Fleming/McEnroe group -- 1. Jean-Julien Rojer and Horia Tecau 3-0 (6-0), 2. Ivan Dodig and Marcelo Melo 2-1 (4-4), 3. Pierre-Hugues Herbert and Nicolas Mahut 1-2 (3-5), 4. Marcin Matkowski and Nenad Zimonjic 0-3 (2-6). Top two teams in each group advance to Saturday's semifinals. finals of the ATP World Tour Finals in London. Saving five match points, top-seeded Bob and Mike Bryan stayed in contention for their fifth ATP World Tour Finals title and seventh straight year-end No. 1 ranking. The 37-year-old defending champions and former Stanford stars edged fourth-seeded Jamie Murray of Great Britain and John Peers of Australia 6-7 (5), 7-6 (5) [16-14] on Thursday in London to clinch a berth in Saturday's semifinals. Murray, the older brother of Andy Murray, and Peers had four match points at 9-5 in the match tiebreaker. On the fourth one, Peers slugged a putaway forehand long. Murray and Peers survived four match points themselves. The Bryans broke Daniel Nestor's record of 34 doubles match victories in the ATP Finals. Roger Federer (3), Switzerland, def. Kei Nishikori (8), Japan, 7-5, 4-6, 6-4. Novak Djokovic (1), Serbia, def. Tomas Berdych (6), Czech Republic, 6-3, 7-5. Stan Smith group -- 1. *Roger Federer 3-0 (6-1), 2. *Novak Djokovic 2-1 (4-2), 3. Kei Nishikori 1-2 (3-5), 4. Tomas Berdych 0-3 (1-6). Ilie Nastase group -- 1. *Rafael Nadal 2-0 (4-0), 2. Andy Murray 1-1 (2-2), 3. Stan Wawrinka 1-1 (2-2), 4. David Ferrer 0-2 (0-4). *Clinched berth in Saturday's semifinals (top two players in each group after three matches advance to semis). Simone Bolelli and Fabio Fognini (5), Italy, def. Rohan Bopanna, India, and Florin Mergea (8), Romania, 6-4, 1-6 [10-5]..
Bob Bryan and Mike Bryan (1), United States, def. Jamie Murray, Great Britain, and John Peers (4), Australia, 6-7 (5), 7-6 (5), 16-14. Ashe/Smith group -- 1. *Rohan Bopanna and Florin Mergea 2-1 (5-2), 2. *Bob Bryan and Mike Bryan 2-1 (4-3). 3. Jamie Murray and John Peers 1-2 (3-5), 4. Simone Bolelli and Fabio Fognini 1-2 (3-5). Fleming/McEnroe group -- 1. *Jean-Julien Rojer and Horia Tecau 2-0 (4-0), 2. Pierre-Hugues Herbert and Nicolas Mahut 1-1 (3-3), 3. Ivan Dodig and Marcelo Melo 1-1 (2-3), 4. Marcin Matkowski and Nenad Zimonjic 0-2 (1-4). *Clinched berth in Saturday's semifinals (top two teams in each group after three matches advance to semis). Rafael Nadal practices at Indian Wells in March. Rafael Nadal has clinched a berth in the semifinals of the ATP World Tour Finals in London. Nadal, the No. 5 seed, defeated No. 2 Andy Murray 6-4, 6-1 today in round-robin play and advanced to Saturday's semis when No. 4 Stan Wawrinka beat No. 7 David Ferrer 7-5, 6-2. After the third game of the first set against Nadal, Murray snipped some hair that was getting in his eyes. Nadal improved to 2-0 in the Ilie Nastase group, and Murray remained in contention at 1-1. Nadal leads Murray in the head-to-head series 16-6. They will play their final round-robin matches on Friday. Murray can earn his first year-end No. 2 ranking with a victory over Wawrinka (1-1) or one loss by Roger Federer (2-0) during the rest of the tournament. Both Nadal and Murray seek their first title in the ATP World Tour Finals, which consists of the top eight singles players and top eight doubles teams of the year. Murray won the first of his 35 tour-level titles, fourth among active players and 17th since the Open era began in 1968, in San Jose at 18 years old in 2006. Rafael Nadal (5), Spain, def. Andy Murray (2), Great Britain, 6-4, 6-1. Stan Wawrinka (4), Switzerland, def. David Ferrer (7), Spain, 7-5, 6-2. Stan Smith group -- 1. Roger Federer 2-0 (4-0), 2. Novak Djokovic 1-1 (2-2), 3. Kei Nishikori 1-1 (2-3), 4. Tomas Berdych 0-2 (1-4). Ilie Nastase group -- 1. Rafael Nadal 2-0 (4-0), 2. Andy Murray 1-1 (2-2), 3. Stan Wawrinka 1-1 (2-2), 4. David Ferrer 0-2 (0-4). Top two players in each group after three matches advance to Saturday's semifinals. Jean-Julien Rojer, Netherlands, and Horia Tecau (2), Romania, def. Ivan Dodig, Croatia, and Marcelo Melo (3), Brazil, 6-4, 7-6 (3). Pierre-Hugues Herbert and Nicolas Mahut (6), France, def. Marcin Matkowski, Poland, and Nenad Zimonjic (7), Serbia, 5-7, 6-3 [10-8]. Ashe/Smith group -- 1. Rohan Bopanna and Florin Mergea 2-0 (4-0), 2. Bob Bryan and Mike Bryan 1-1 (2-2). 3. Jamie Murray and John Peers 1-1 (2-3), 4. Simone Bolelli and Fabio Fognini 0-2 (1-4). Fleming/McEnroe group -- 1. Jean-Julien Rojer and Horia Tecau 2-0 (4-0), 2. Pierre-Hugues Herbert and Nicolas Mahut 1-1 (3-3), 3. Ivan Dodig and Marcelo Melo 1-1 (2-3), 4. Marcin Matkowski and Nenad Zimonjic 0-2 (1-4). Top two teams in each group after three matches advance to Saturday's semifinals. Daily tickets and daily double packages for the 2016 BNP Paribas Open in Indian Wells, Calif., went on sale today, chief executive officer Raymond Moore announced. The tournament, the largest combined men's and women's event in the world other than the four Grand Slams, is scheduled for March 7-20 at the Indian Wells Tennis Garden. Daily loge and grandstand tickets for Stadium 1 range from $20 for the first Thursday evening session to $70 and $110 for grandstand and loge seats, respectively, for championship weekend. The daily double package guarantees the same seat (suite, box or loge) for day and evening sessions. Residents of Indian Wells, students, seniors, military personnel and USTA members can receive 30 percent off on loge seats in Stadium 1 from March 9 to 17. Daily tickets for reserved seats in Stadium 2 in the lower bowl, including the 100 sections and select 200 sections, begin at $150. Access to some 200 sections in the lower bowl and to all sections in the upper bowl is on a general admission basis and available to anyone holding a tournament ticket. Daily tickets for reserved seats in Stadium 3 also are available beginning at $90. Every tournament ticket provides access to the general admission sections of Stadiums 1 through 9 for day sessions. Series, mini, group and hotel packages also are available. For more information or to purchase tickets, visit bnpparibasopen.com or call (800) 999-1585. Another week, another good tournament for Dennis Novikov. At this rate, the 22-year-old resident of Milpitas in the San Francisco Bay Area will crack the top 100 in the world for the first time early next year. Novikov reached the semifinals of the $50,000 Knoxville (Tenn.) Challenger in singles and doubles (with countryman Eric Quigley) last week. He improved nine places in singles to a career-high No. 133 and eight spots in doubles to No. 179 this week. Novikov, 6-foot-4 (1.93 meters) and 200 pounds (91 kilograms), began the year at No. 291 in singles and No. 425 in doubles. Collin Altamirano, 19-year-old Sacramento resident -- No. 813 in singles (+2), 957 in doubles (-1). Bob Bryan, 36-year-old former Stanford star, part-time member of Sacramento-based California Dream in World TeamTennis in 2015 -- No. 2 in doubles (no change), unranked in singles. Mike Bryan, 37-year-old former Stanford star, part-time member of Dream in 2015 -- No. 2 in doubles (no change), unranked in singles. Bradley Klahn, 25-year-old former Stanford star -- No. 516 in singles (+3), No. 750 in doubles (-303). Mackenzie McDonald, 20-year-old resident of Piedmont in San Francisco Bay Area -- No. 461 in singles (-5), No. 545 in doubles (-2). Dennis Novikov, 22-year-old resident of Milpitas in San Francisco Bay Area -- Career-high No. 133 in singles (+9), No. 179 in doubles (+8). Tennys Sandgren, 24-year-old member of California Dream -- No. 256 in singles (+18), No. 197 in doubles (-5). Matt Seeberger, 31-year-old San Francisco native and former UC Santa Cruz star -- No. 166 in doubles (+12). Neal Skupski, 25-year-old member of California Dream -- No. 102 in doubles (+6). Dmitry Tursunov, 32-year-old resident of Folsom in Sacramento area -- No. 263 in doubles (+13). Kristie Ahn, 23-year-old former Stanford star -- No. 212 in singles (-4), No. 410 in doubles (-5). CiCi Bellis, 16-year-old resident of Atherton in San Francisco Bay Area -- No. 250 in singles (-2). Alexandra Facey, 22-year-old product of Cameron Park in Sacramento area -- No. 619 in doubles (-4). Kat Facey, 22-year-old product of Cameron Park in Sacramento area -- No. 619 in doubles (-4). Jarmila Gajdosova, 28-year-old member of California Dream (2015) -- No. 106 in singles (-4), No. 139 in doubles (+1). Nicole Gibbs, 22-year-old former Stanford star -- No. 121 in singles (-2), career-high No. 194 in doubles (+1). Michaela Gordon, 16-year-old resident of Saratoga in San Francisco Bay Area -- No. 660 in singles (+24), No. 853 in doubles (-5). Maegan Manasse, 20-year-old Cal junior -- No. 518 in doubles (-7), No. 753 in singles (-6). Maria Sanchez, 25-year-old Modesto product -- No. 87 in doubles (-2), No. 193 in singles(+1). Carol Zhao, 20-year-old Stanford junior -- No. 190 in doubles (-1), No. 347 in singles (-3).